I recently visited Chicago for the Northwestern Residency Showcase and spent quality time with my boyfriend, Chad who lives in the city. It was a wonderful weekend, minus the airport delays. 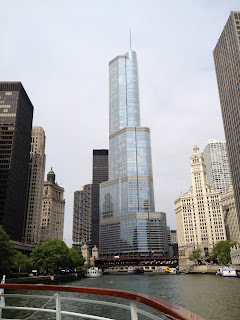 I did some Chicago site-seeing on the architectural boat tour on the Chicago River and was able to take a tour and met some great people at Northwestern Feinberg School of Medicine. I included some pictures below of my time in Chicago. On another note... HAPPY MOTHER'S DAY! Check out the "Thoughts" section as I included a short entry about my Mom who I miss and love so much. I also posted an entry in the "Medicine" section, as I started my last rotation of 3rd year last Monday, Internal Medicine. Lastly, check out the "Wellness" section for a Part I entry on Natural Hair. While in Chicago at the Residency Showcase, a group of us were having a conversation over lunch about going natural hair and its benefits compared to relaxed hair. Who wouldn't want to deliver a baby here! the penthouse is going for 35 million...any takers?